Last year I embarked on a self-imposed mission to dive into the works of Alfred Hitchcock. With no real plan of attack, other than to view as many of his films as possible, I aimlessly bounced between Hitchcock’s early silent film works and his later films. I was making good headway into his canon before abruptly stopping due to what can only be called, a mild case of Hitchcock overdose. After a brief hiatus the fever to explore the world of Hitchcock has been once again reignited thanks to this month’s Blind Spot selection, Notorious. 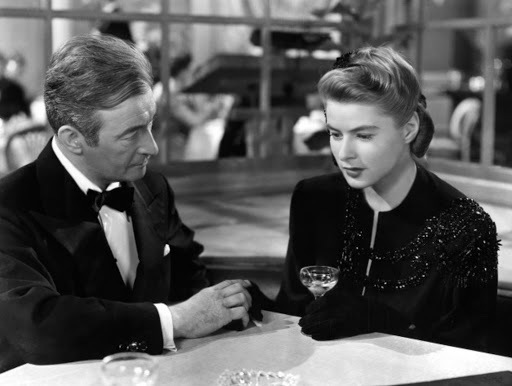 After her father is convicted of being a Nazi spy in America, Alicia Huberman’s (Ingrid Bergman) life is constantly under the microscope as the police routinely follow her every movement. When throwing a dinner party one night, Huberman meets a dashing stranger named T.R. Devlin (Cary Grant). Huberman eventually discovers that Devlin is a U.S. intelligence agent who has been instructed to recruit her for a special mission. Though the pair indulges in some fiery back and forth banter, the attraction is clearly there. While on route to Rio de Janeiro, where the true nature of Huberman’s assignment will be revealed, the pair fall madly in love with each other. However, things get complicated when Devlin must not only wrestle with the fact that Huberman used to be a wild party girl, but also that her past will play a key role in her assignment. Huberman’s main job for the intelligence agency will be to infiltrate the home of a top Nazi member named Alexander Sebastian (Claude Rains). Considering Alexander use to work with Huberman’s father, not to mention he has always held a flame for her, Devlin’s bosses believe Huberman would be the perfect person to seduce Sebastian and acquire information. Soon the mission begins to become emotionally taxing on Huberman and Devlin’s relationship as Huberman delves deeper undercover and finds herself in grave danger. 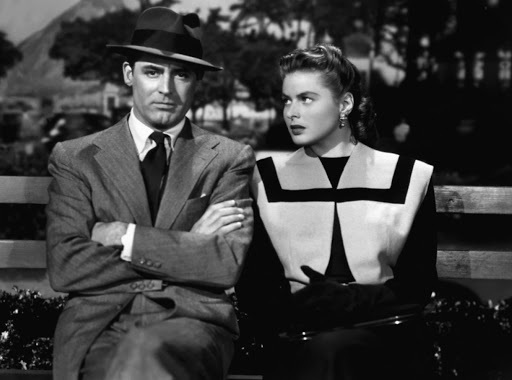 Notorious is a brilliantly crafted film that thrives on having several troupes intersecting with one another at the same time. At its heart, the film is a love story about two people who foolishly let their pride get in the way of their true emotions. Devlin clearly does not want Huberman to take the mission, but instead of speaking up, he opts to let Huberman decide for herself. Huberman, on the other hand, is hoping that Devlin’s love for her will lead him to protest against her mission. She not only interprets his silence as his approval of the assignment, but reluctantly prostitutes herself to Sebastian because she feels this is what will make Devlin happy. Of course, as is the case with all relationships, it is the things that go unsaid that eventually lead to resentment. Hitchcock exploits this resentment by making the assignment increasingly more complex as the film goes on. It is not the information that Huberman uncovers that is really important; in fact Hitchcock himself put very little stock into the data outside of a few lines of dialogue. 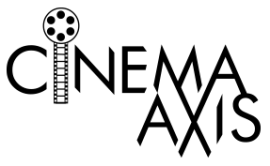 What is intriguing to both Hitchcock and the viewer is what Huberman must go through to acquire the information. Huberman is often treated like a piece of meat being thrown into the lion’s den. Devlin frequently gives her the cold shoulder and his bosses show no sign of having an escape plan for her if things go wrong. Despite this, Huberman’s love for Devlin is what propels her further down the dangerous road she ultimately finds herself on. The combination of Ingrid Bergman’s performance and Hitchcock’s ability to draw out tension with a few choice shots is a potent mixture that is outstanding on every level. As Huberman’s mission becomes more difficult to orchestrate, Bergman does an exceptional job of highlighting just how in over her head her character really is. She becomes a victim in every sense of the word. This really helps to emphasize the sense of dread that Hitchcock incorporates into the final third of the film. By simply showing a shot of a missing key back on a key chain, or a close up of a cup coffee, Hitchcock manages to turn his tale of espionage and romance into a chilling thriller. It can even be argued that Hitchcock evokes even more fear and terror in the final thirty minutes than most horror films can pull off in a full ninety. Need proof? Just watch the sequence in which Devlin and Sebastian try to play it cool when under the cold gaze of Sebastian’s Nazi comrades. While much of this is a result of Bergman and Hitchcock’s perfect work, the supporting work from Rains and Leopoldine Konstantin, who plays Sebastian’s sinister mother Anna, should also be noted as well. Once the true extent of their evil is uncovered, Hitchcock allows both Rains and Konstantin to truly revel in their character’s vengeance. The scary thing about them, which Hitchcock astutely points out, is that there is even far worst evil out there than Sebastian and his mother. Again, one only needs to look at the few scenes involving Sebastain’s colleagues. Notorious is a film that can truly be considered a masterpiece in cinema. Everything from the performances, story structure, and overall execution is simply flawless. It is not only one of Hitchcock’s best, but it is one of the greatest films in cinematic history. I totally agree! Notorious is one of my favorites from Hitchcock's career, if not the top choice. I'm glad you finally caught up with this Courtney. I totally considered this for this month! I was so indecisive between the Hitchcocks I hadn't seen that I ended up going for something entirely different. I can see how the going in with already high expectations can slightly ruin your experience with this film. Fortunately, I had watched enough good and bad Hitchcock films to know it is always best to approach his works with tempered expectations. Especially since his films seem to bring out such diverse reactions in people. For example, I loved both The 39 Steps and The Lady Vanishes but was slightly underwhelmed with Dial M for Murder and Topaz. However, there are many who have the exact opposite reaction to those same films. Strangers on a Train was my former number one Hitchcock film, but this has now surpassed that for me. I still have a slew of Hitchcock films that I need to see (e.g. Rebecca, Rope, The Man Who Knew Too Much, Spellbound, etc). So I can understand the indecisiveness in regards to choosing what to tackle next. Notorious is not only my favourite Hitchcock but is also one of my all time favourites. So I am glad to see you on board.The pairing of Grant and Bergman does wonders for me. It almost hurts to see them together in one frame in this. And the camerawork! (camera going down the stairs, pointing aimlessly until it settles on the key in Alicia's hands… Beautiful!!) I can go on and on… Just LOVE this movie! My favorite Hitchcock! Glad you got to this one. Like most great sequences of Hitchcock suspense, it's all about the implications, like you said, the fear that he expresses through imagery. But what brings me back to this is the fatal relationship between Huberman and Devlin. They clearly want each other, but, like you say, they're too proud and that leads to both of them inflicting a lot of their emotional pain onto each other. It's one of my favorite romances, it's desperate, biting and self-destructive, but almost always motivated by a love that's simply been misdirected. Hitchcock really focuses a lot on hands in the film. There is a great scene early on, when Alicia is driving at high speeds, where Hitchcock focuses on Devlin’s apprehensive hand hovering over the steering wheel. I loved the subtle tension in that film. Their pride makes the final act absolutely riveting. My heart was breaking when Huberman was suffering in silence while not knowing what really happening to her. The film is the perfect example of how love can be both powerful and self-destructive. Glad you caught this one. I agree that it is an inarguable masterpiece of cinema. It's not even my favorite Hitch (which really says something about his career), but I love it all the same.And I agree, Hitch could often terrify us more than any horror film. Which Hitchcock film ranks tops for you?